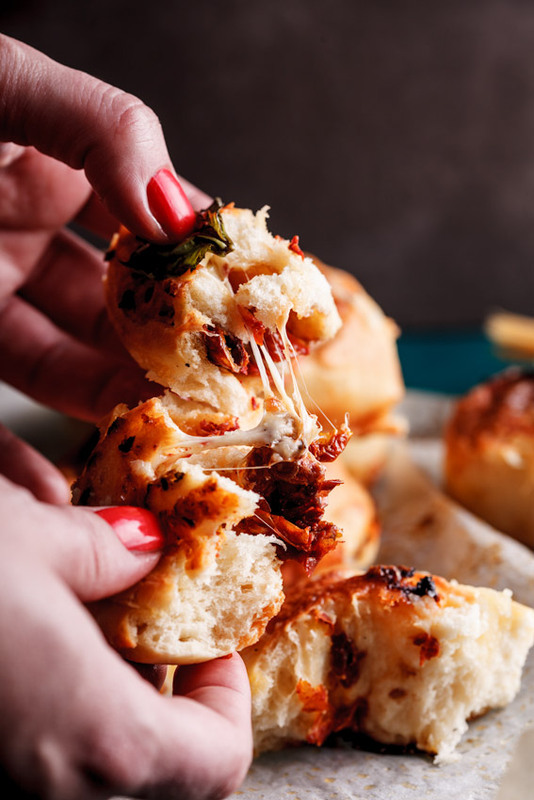 Easy, cheesy pizza rolls stuffed with fresh basil, sundried tomatoes and melty mozzarella brushed with garlic butter make the ultimate snack. Yup, this is happening. 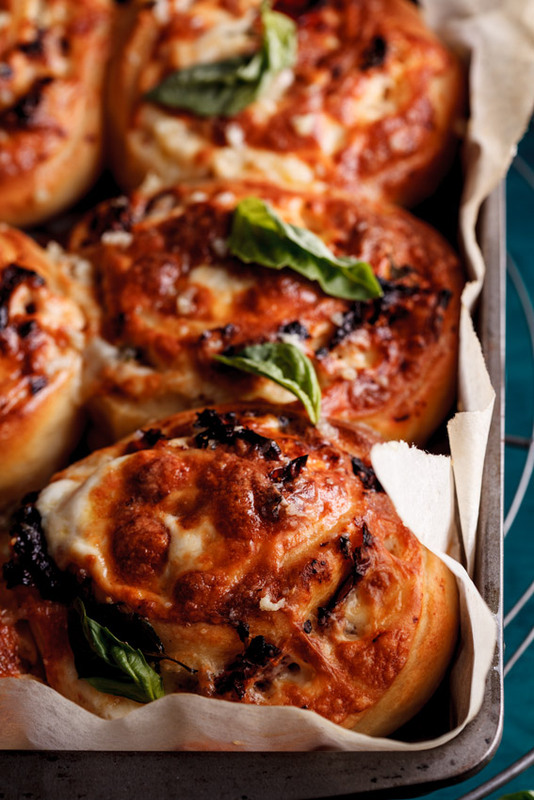 I really did just take a brioche-like dough, filled it with fresh basil, sundried tomatoes and mozzarella cheese. And then when the rolls were golden brown and the cheese was perfectly oozy, I brushed them with garlic butter. Phwoar. I warned you on Twitter yesterday that you need to gird your loins for this one, and I wasn’t lying. As a recipe developer there are many times when I feel like my mojo has just left me and I need to make peace with it but then something small starts brewing in the back of my mind and that something turns into an idea and then I just roll with it. And most often, those are what turns into my genius ideas. Can you tell how modest I am? But seriously, I have had some moments where I just know this is what I’m meant to be doing. Like when I made my Baked gnocchi with tomatoes and bacon or my Bacon corn bread. (Mmm, I just realised that both of those include bacon. I knew that bacon would be the key to my success, I just knew it!) And there’s something very satisfying about knowing that you’re actually good at your job, because Heaven knows, there are so many times when you think you’re not. But I digress, this recipe is one of those genius ones. 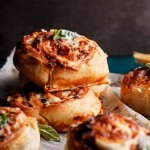 Taking something as much-loved as a pizza and turning it into a simple bun was an idea that came to me when I wanted to develop a savoury version of a cinnamon bun. I played around with filling the brioche-like dough with garlic butter and cheese but eventually settled on this filling. It was only after I had eaten one that I realised that these were pretty much a simple Margharita pizza, just rolled up. You could of course add other ingredients like bacon (!! ), chorizo cubes, sautéed mushrooms or onions. Heck, you could even make them in your favourite pizza flavour. Hawaiian pizza rolls, anyone? Yes please! I think these are a great option for lunch boxes, easy lunches or a decadent snack. So go now, make these and PLEASE tweet/Instagram the pics and tag me in them. I’d love to see what you guys come up with. 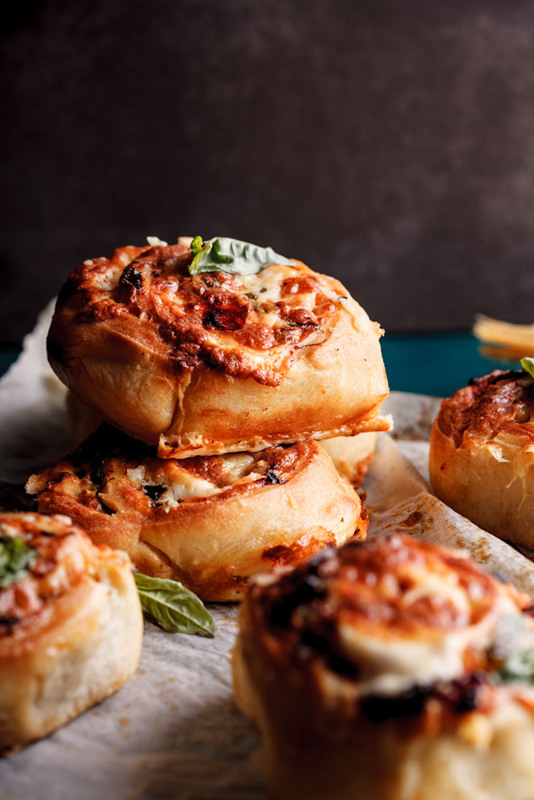 Easy, cheesy pizza rolls stuffed with fresh basil, sundried tomatoes and melty mozzarella brushed with garlic butter make the ultimate snack. Allow 1-2 hours rising time for the dough. Combine the warmed milk, yeast and sugar in the bowl of a freestanding mixer and allow to stand for 5 minutes. Whisk in the eggs then with the mixer running, add the flour and salt and allow to mix for 5 minutes until well combined. Remove from the bowl and turn out onto a floured surface. Knead the dough for 5-10 minutes until you have a sticky, elastic dough. Place in an oiled bowl and cover with cling wrap. Allow to rise for 1-2 hours until the dough has doubled in volume. Line an oven proof casserole dish with baking paper. 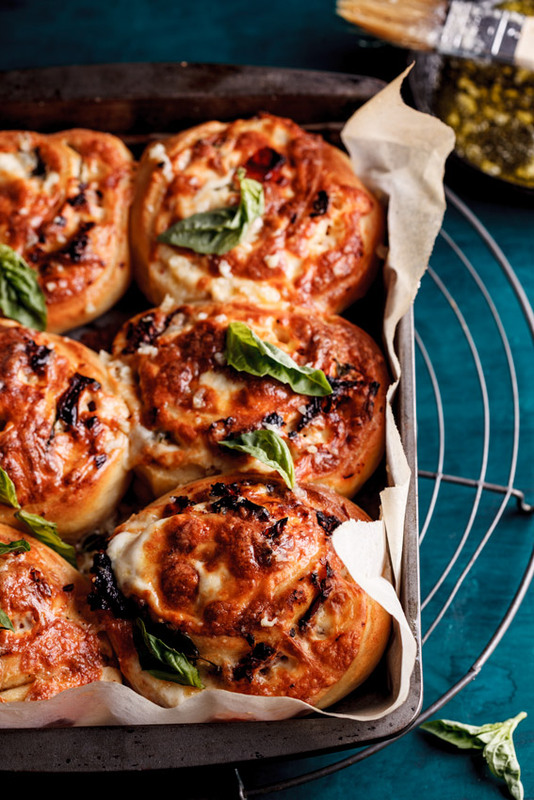 When the dough has risen, roll it out on a floured surface then sprinkle over the sundried tomatoes, cheese and basil. Season to taste then roll up, lengthwise. With a serrated knife, slice the roll into rolls around 3cm wide. Place the rolls in the prepared casserole dish and allow to rise for 30 minutes while the oven pre-heats to 180°c. Bake the rolls for 20-25 minutes until they are golden brown and cooked through. In the meanwhile, melt the butter in a small saucepan/pan with the garlic and lemon juice. When the rolls are cooked, remove them from the oven and brush with the garlic butter. 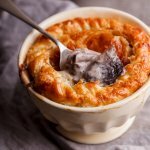 Allow to cool slightly then serve. Suppose this is a silly question but can you use this dough to make regular pizza as well? Hi Simone, not a silly question at all! Actually, this dough is more bready in consistency so I’m not sure it will make the best pizza, unless you like a thicker crust. I suppose you could, I’ve never tried it before though. Let me know how it turns out if you try it. Could you use this same dough for a sweet version? Thanks and your recipes are amazing! Wow do these look so good! The are a perfect holiday snack! Thanks T! I think so too! 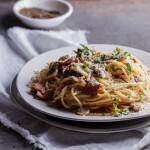 I think I love you….this is the best recipe I’ve seen all day! !